I then added a few more to the mix, including some laid on the ground firing, two trench raiders cutting wire and preparing a multiheaded grenade and a Mauser 1918 T-Gewehr Anti-Tank rifle team. And the two trench raiders. I am toying with the idea of going entirely over the metal in 20mm as these figures are so good compared to the plastic ones I already have. These are the first but by no means last, so I'll post more pictures of the others as they get finished. Today is the 100th Anniversary of the Battle of Mons, the first major engagement by the British Expeditionary Force in the First World War. 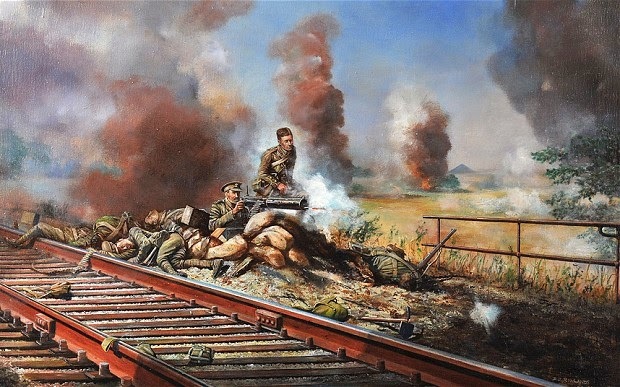 The defence of the of the Nimy bridge against German attacks also marks the awarding of the first two VCs of the war; Lt Dease and Pvt Godley. Cheers Dave, I'm glad you liked them! They look great- really like them.